A proposed law to make it illegal for sports coaches to have sexual relations with 16 and 17-year-olds in their care has been "bogged down in bureaucracy", an ex-sports minister has said. 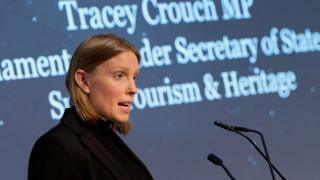 Tracey Crouch, the minister who first announced the law change in 2017, criticised the government for failing to protect "vulnerable people". The NSPCC said it was "absolutely outrageous" the law had yet to come in. The Ministry of Justice said the law continued to be kept "under review". The age of consent in the UK is 16, although that is extended to 18 if a person holds a position of trust. The law currently covers teachers, hospital workers and carers, but not sports coaches. Ms Crouch - a Conservative MP who resigned as sports minister in November 2018 - told BBC Two's Victoria Derbyshire programme that if the law was not brought in soon she would look to change the legislation herself, perhaps through a backbench private members' bill. She described the law as a "no-brainer". "It is about protecting vulnerable people from an abuse of power," she said. "Frustratingly it seems to have got bogged down in bureaucracy at the Ministry of Justice, the department that owns the legislation." The chief executive of the children's charity NSPCC, Peter Wanless, said it was "absolutely outrageous" the law had not yet been introduced. "Government promised to extend these laws to sports coaches, but we've yet to see action and I fear they are backtracking," he added. Ms Crouch's comments come just days after an inquiry found the Lawn Tennis Association missed repeated warnings about bullying and sexual abuse at one of the UK's top tennis centres. The Ministry of Justice said in a statement: "We remain absolutely committed to protecting children and young people from the horrors of sexual abuse. "Offenders already face tough punishments and we continue to keep the law under review." Follow the Victoria Derbyshire programme on Facebook and Twitter - and see more of our stories here.